Polyamines are organic cations found in all eukaryotic cells and intimately involved in, and required for, distinct biological functions. An increasing body of evidence indicates that the regulation of cellular polyamines is a central convergence point for the multiple signaling pathways driving various cellular functions. Over the last decade, considerable progress has been made in und- standing the molecular functions of cellular polyamines. These significant findings provide a fundamental basis to not only define the exact role of polyamines in physiology, but also to develop new therapeutic approaches for cancers and other diseases. The major objective of this book is to provide a timely and long lasting guide for investigators in the fields of polyamines, physiology, pharmacology, and cancer research. It will provide a foundation based on research and address the potential for subsequent applications in clinical practice. 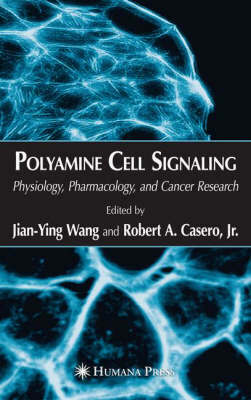 Polyamine Cell Signaling: Physiology, Pharmacology, and Cancer Research is divided into four main parts: Part I: Polyamines in Signal Transduction of Cell Proliferation Part II: Polyamines in Cellular Signaling of Apoptosis, Carcinogenesis, and Cancer Therapy Part III: Polyamines in Cell Motility and Cell-Cell Interactions Part IV: Polyamine Homeostasis and Transport This book not only covers the current state-of-the-art findings relevant to cellular and molecular functions of polyamines, but also provides the underlying conceptual basis and knowledge regarding potential therapeutic targeting of polyamines and polyamine metabolism. These points are addressed by int- nationally recognized experts in their contributions to this book.